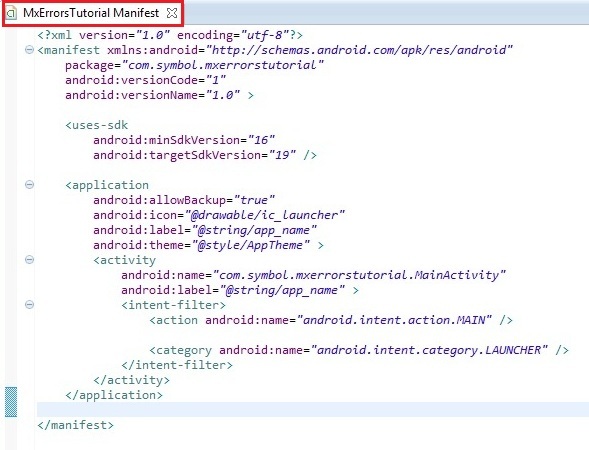 This guide will walk you through creating an EMDK For Android application that will analyze MX errors that we get while using MX features that are declared in Profile creation. These MX errors may occur due to some invalid input while creating a profile or some incorrect device configuration. 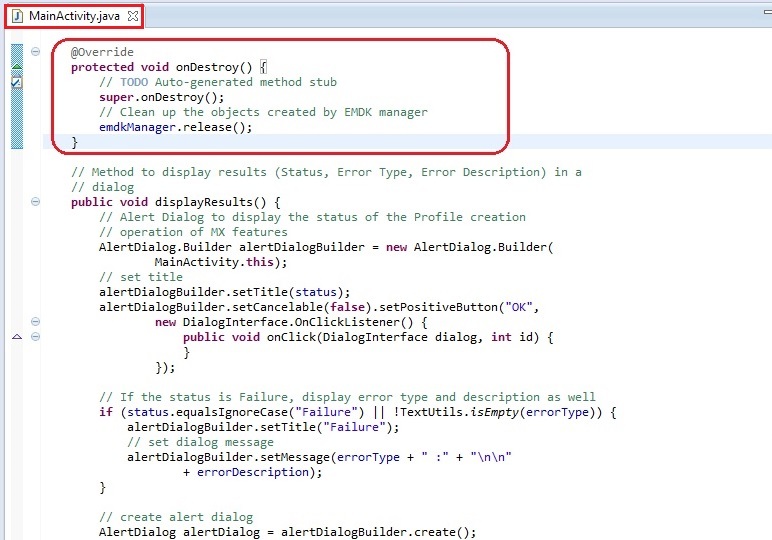 In this tutorial we would be deliberately producing errors by providing invalid inputs in some of the MX features while profile creation, just to see the errors using getStatusDocument or getStatusString of EMDKResults. We would obtain the error description by parsing the resulting XML response and compare the output with the usual working case. The goal here is to make you understand how to find errors and correct them if there are any. 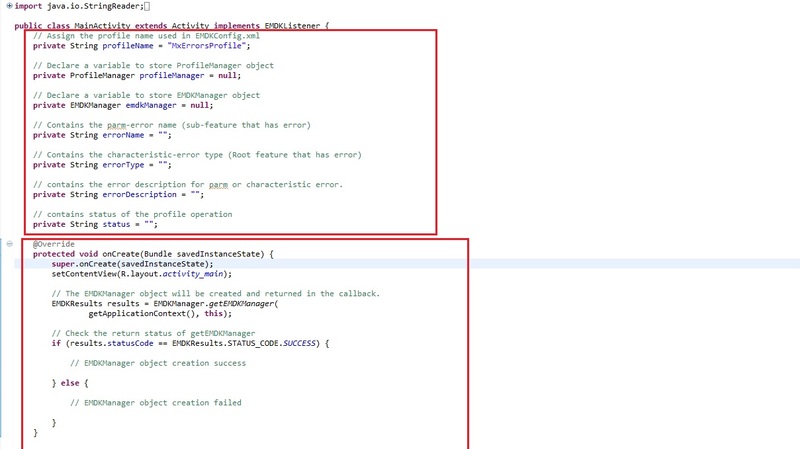 Note: Provide "MxErrorsTutorial" as the project name for this tutorial. 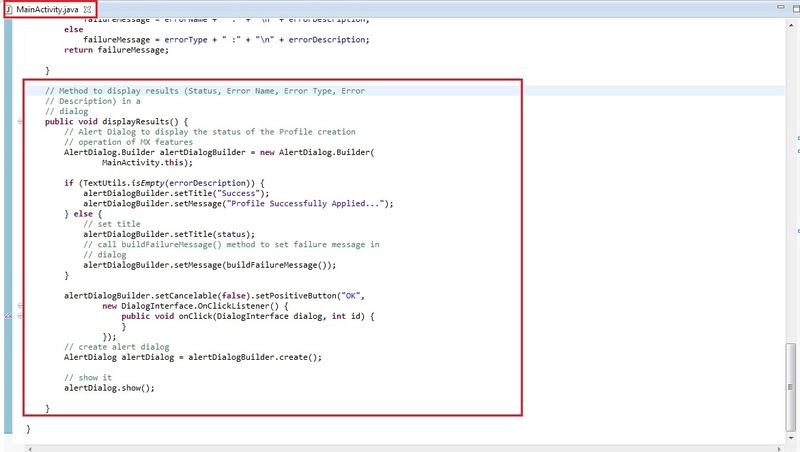 Provide "MxErrorsProfile" as the Profile Name for this tutorial. Now, you can see all these MX features on the left hand side of the Profile Editor window. Select "Clock" feature from the list and click "Right Arrow". The parameter list will be populated. 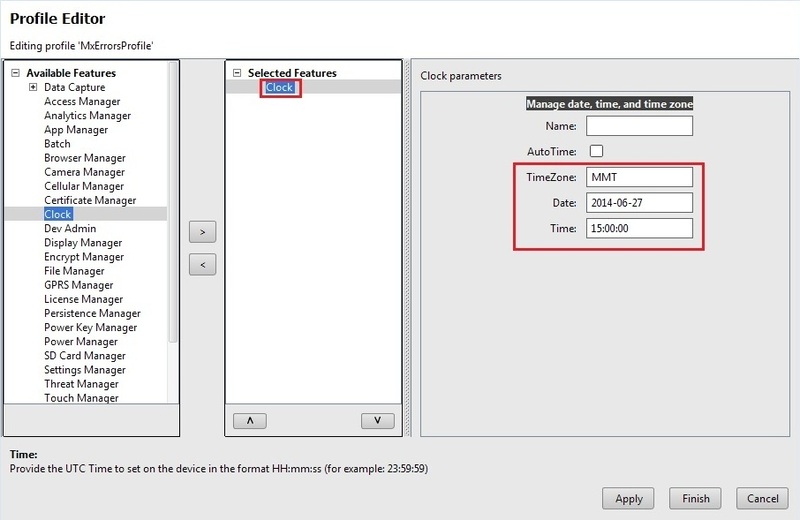 Using this feature, we will configure the device clock. But we will provide incorrect values while setting Clock parameters and in the code we will parse the XML response and display the result in a dialog. 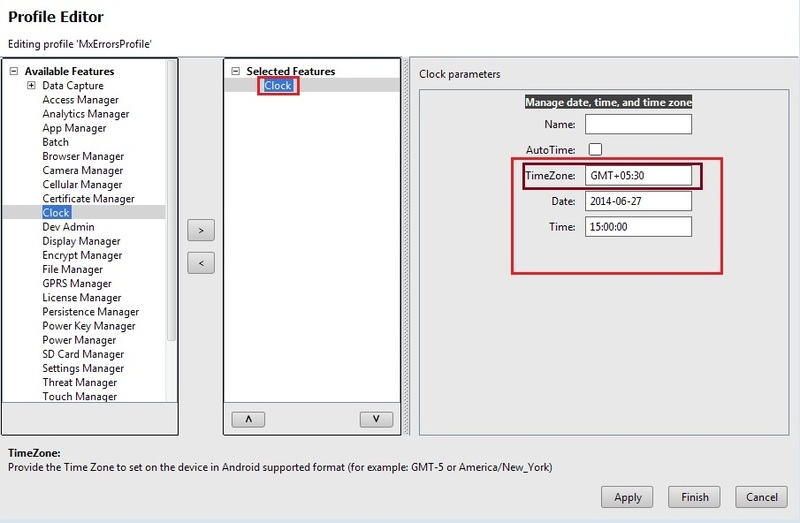 Enter the Clock parameters such as Timezone, Date and Time. The parameters need to be in a certain format mentioned in the wizard for each field. But we will enter incorrect value in the "Timezone" field (For Example "MMT" which is not a valid TimeZone) and proceed. Note: Keep the "Name" field empty and AutoTime field unchecked. You can inspect the "EMDKConfig.xml" under "\assets" folder to see it is reflecting the changes made to the parameters via EMDK Profile Manager GUI earlier. 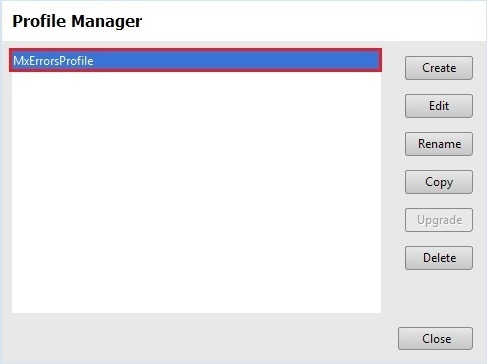 However, it is advised that this file not be manually updated and only be controlled via the Profile Manager. 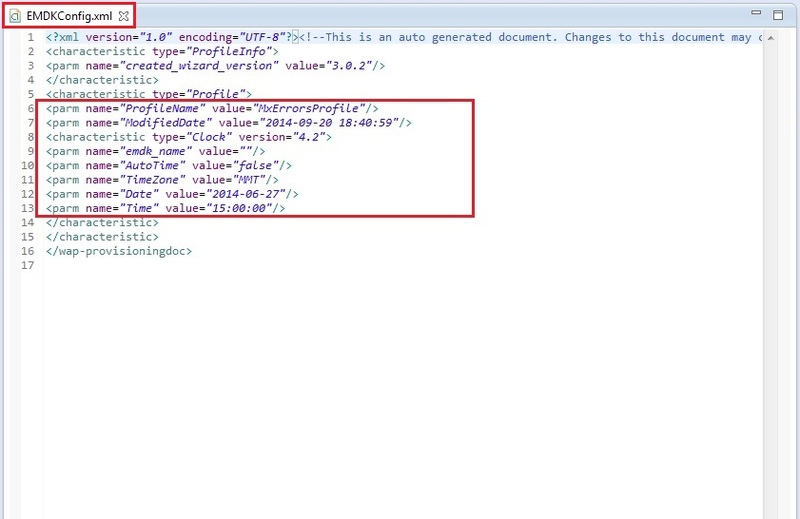 An entry of "Clock" feature is created in EMDKConfig.xml file with the attributes that we had set while profile creation. That's it!!! We are done with all the coding and incorrect configuration. Now let us run the application and we should get the error in a dialog. We get the following XML response as a return of results.getStatusString() in the onOpened method, which was saved in a statusXMLResponse String. 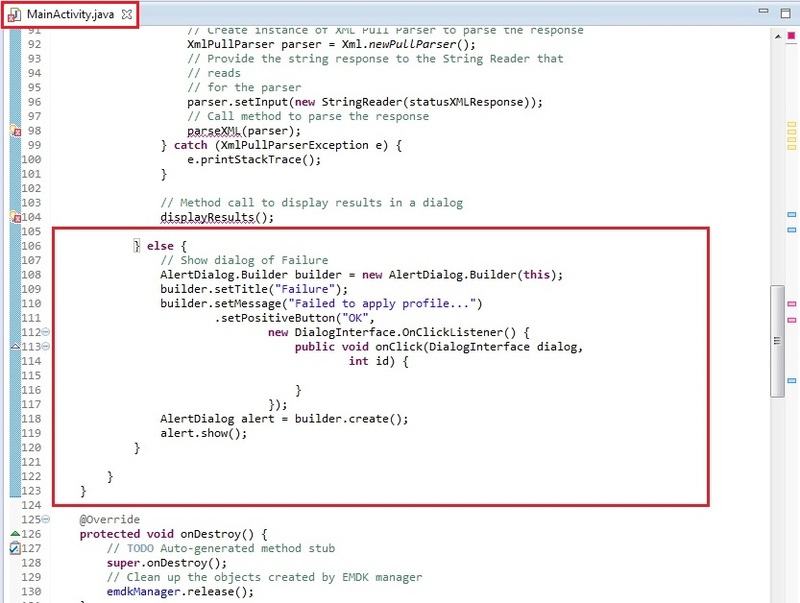 Since the response contains <parm-error> tag, the EMDK fails to set the clock. 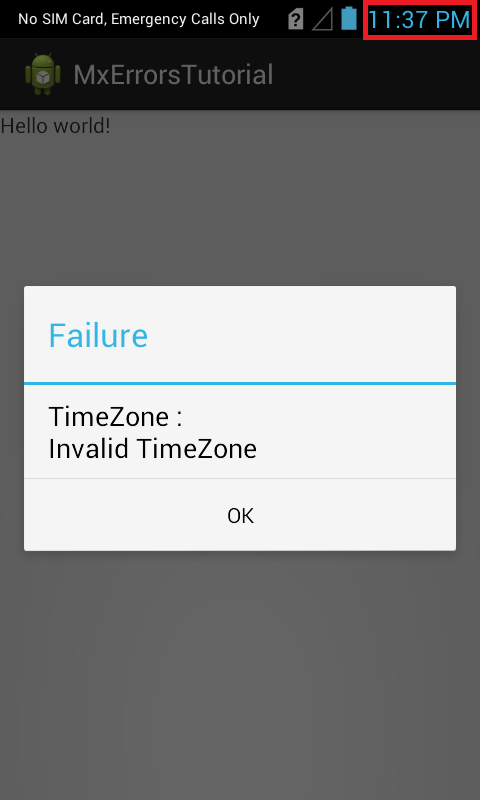 This is because we had set an incorrect value for "TimeZone" field ("MMT" instead of something like "GMT+05:30"). So when we parsed the response we looked for this parm-error tag and parsed name and desc fields of this error tag. Finally we displayed these field in an Alert Dialog to the user. 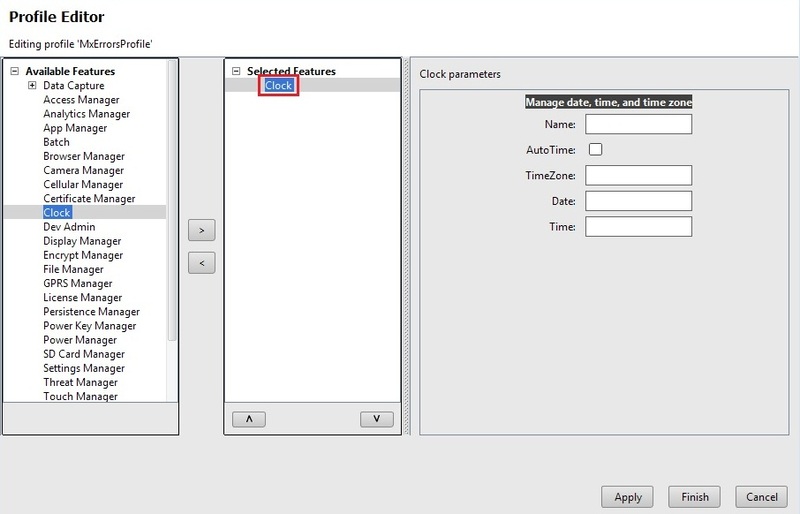 Now let's correct the parameters and get the valid output that can change the clock settings with the parameters that we declared during profile creation. So first we will go to profile manager and edit it with the valid "TimeZone" value ("GMT+05:30" instead of "MMT"). Click "Apply", "Finish" and then "Close". Now since we provided valid inputs, we get a valid XML response without errors. 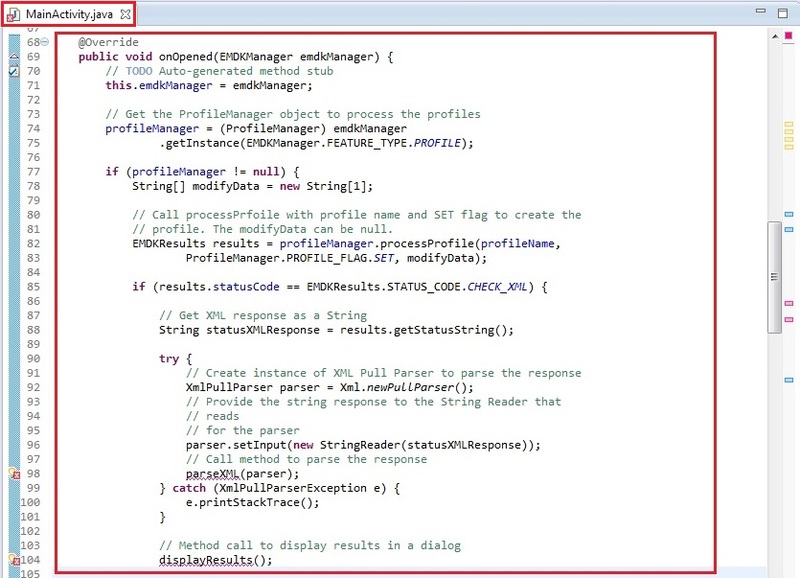 As you can see its a valid XML response since it does not contain any <characteristic-error> or <parm-error> tag. 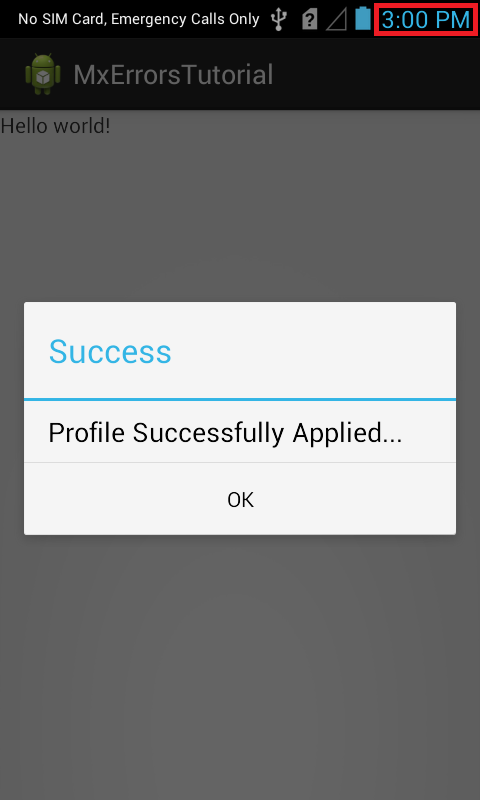 Moreover, the clock parameters that we set during profile creation are also applied successfully to the device. In such a way, you can use EMDKResults API with its methods to identify any kind of errors in all the MX features that you used while profile creation. 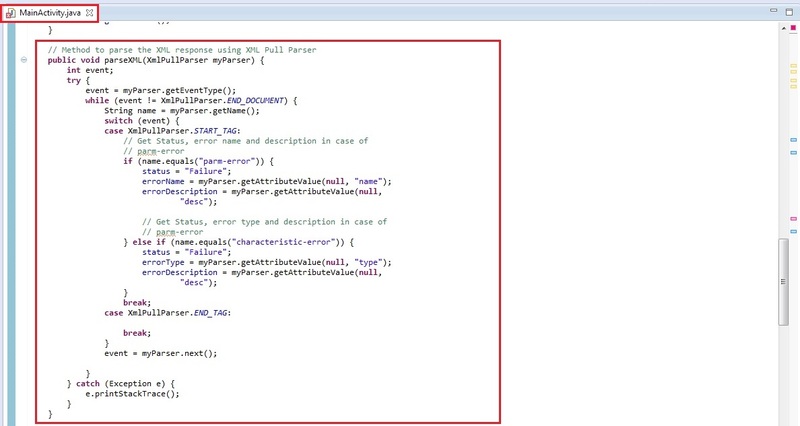 This helps in debugging your application to figure out invalid parameters. 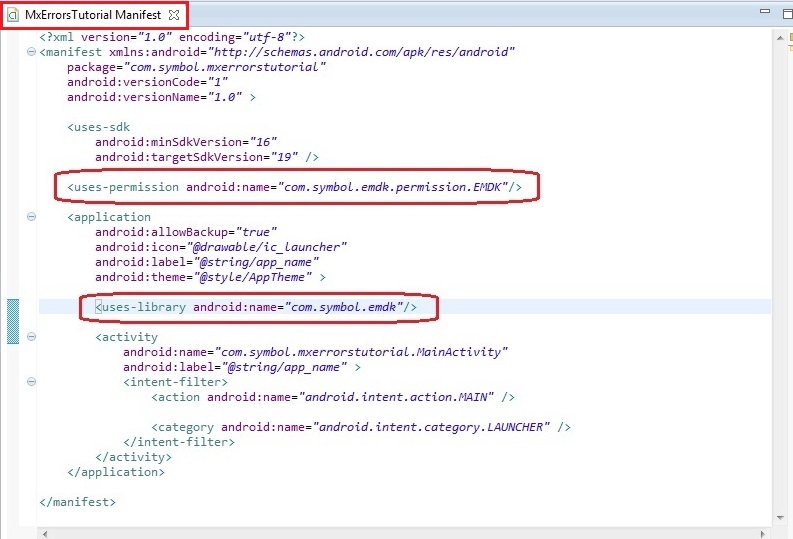 Installing the EMDK for Android application without deploying the EMDK runtime on a Symbol device will fail because of missing shared library on the device.